My kids enjoy looking through our old photo albums. There's something about flipping through the pages that doesn't compare to sliding from picture to picture on their phones. It's especially fun for them to share the old photos with their better halves. Our "new" kids, son-in-law Pete, daughter-in-law Nicole and soon to be daughter-in-law Chrissy didn't know our family and friends until we were all much older and they find some of our pictures to be adorable but most of them to be hysterical! They'll snap pictures of our pictures to save to their phones or to send to one of our family members or friends who they think will find the picture as hysterical as they do. Older son, Joe makes sure he points out the mushroom haircut he endured throughout his entire childhood and younger son, Mike will still ask why I needed to dress him and his brother alike when they were far from being twins since they are a good 3 1/2 years apart. And forget about the "tail" he wore all those years when I wouldn't let the barber cut that one piece of hair in the back of his head! I must have styled daughter, Lisa to her liking because she never complains or it may be that she doesn't think it's as funny as her brothers to poke fun at my mothering skills, or lack of I should say! But the the pictures we enjoy more than anything are of the vacations we took. Every year we went on a camping trip with four to five other families. We have camped in almost every state along the east coast with our best friends. The photos jog our memories of the fun we had, the things we learned about each state and who we enjoyed it all with. 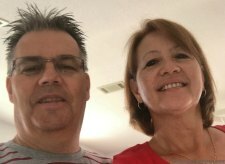 Every year we also went to Florida to visit Grandma and Grandpa. Our photos remind of us of how much we loved spending time with them and how they loved playing cards with us and joining us on our visits to Disney World, Sea World and every other amusement park in Florida. We have lots of pictures of the wonderful times we spent with our family and friends in Japan and the vacations the five of us took by ourselves to Washington, DC, Ohio and so much more. If we didn't have our pictures we would never remember what we did where. 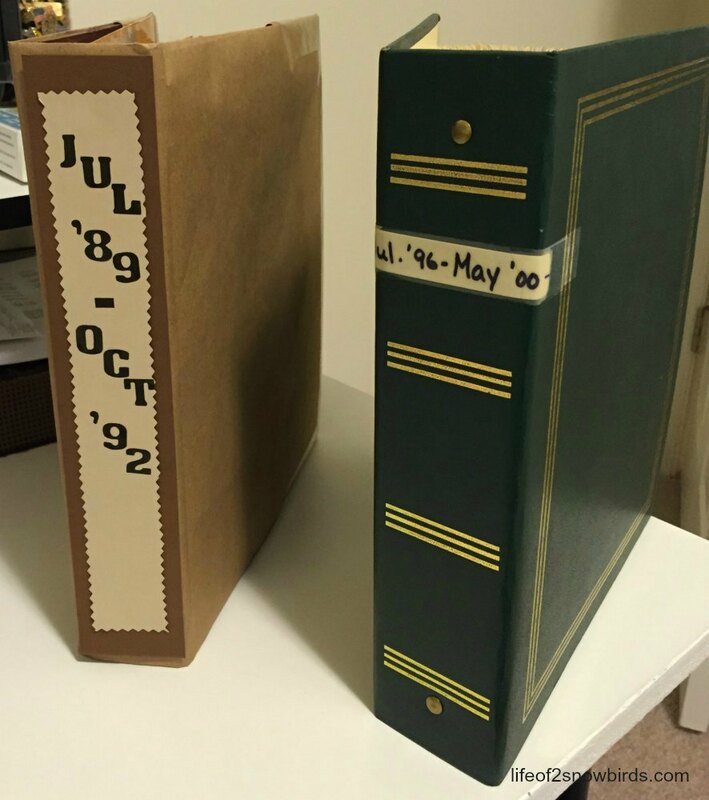 So I've always kept our photo albums out and accessible to everyone but they were getting so worn and old and becoming such an eyesore in our living room. I really didn't want to buy brand new albums and not only have the expense of replacing them but also the task of transferring every picture from the old to new so I came up with this idea of updating our albums. 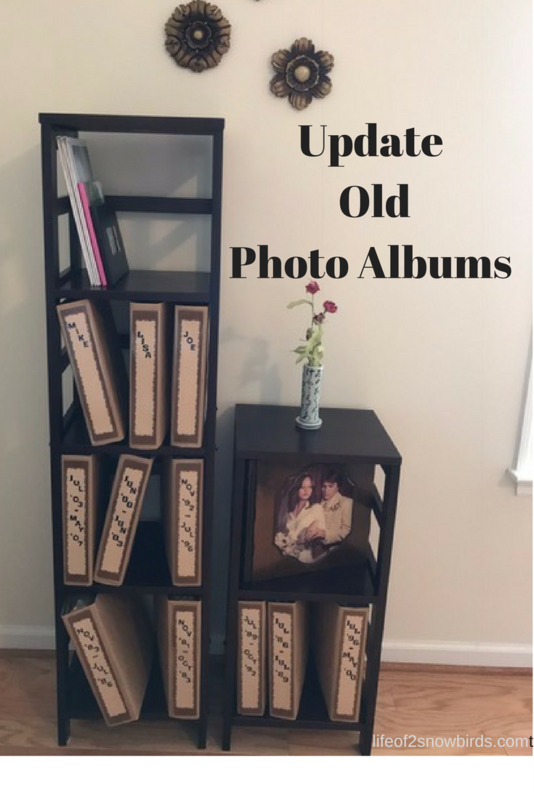 If you have old photo albums that need a quick update this was a pretty easy fix. 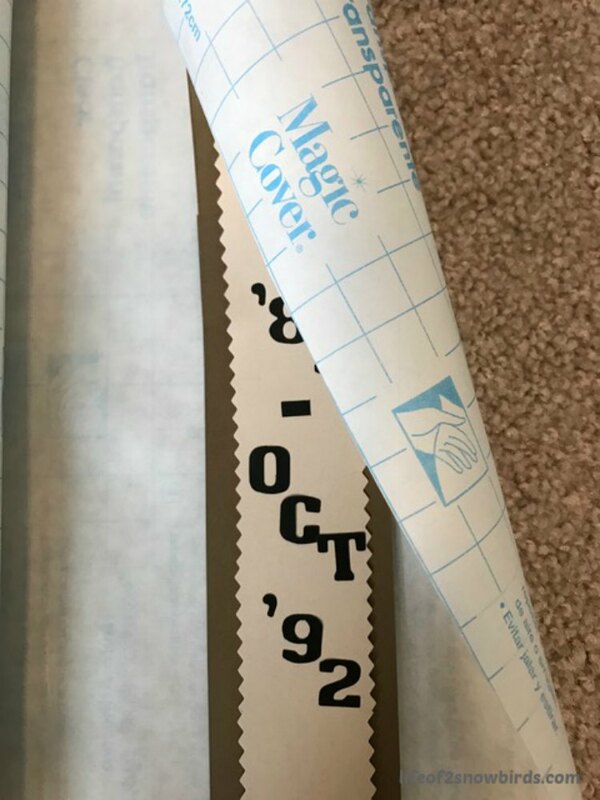 Place photo album on the mailing paper and measure leaving 3" from each side of the album and 1 1/2' on the top and bottom then cut. 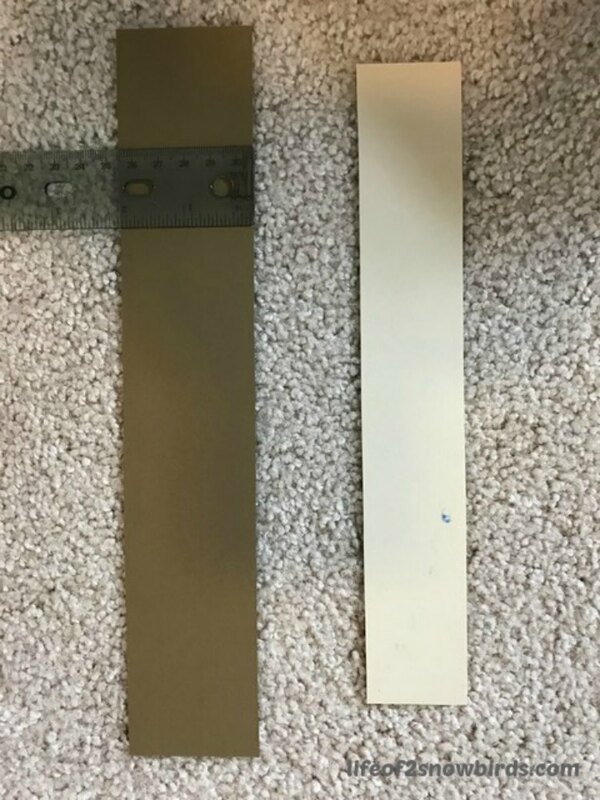 Measure 1 1/2" from bottom and top and fold. 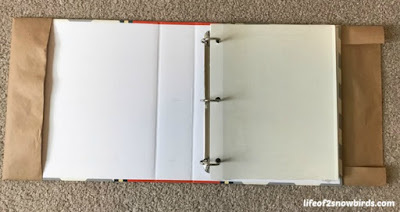 Fold the two sides over and insert the front and back covers. 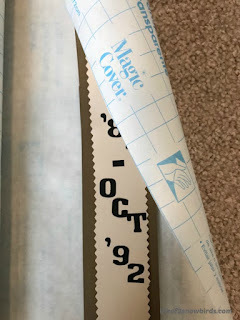 Taping the corners of your photo album cover will help to keep the cover on your album. 9 1/2" X 1 1/2". 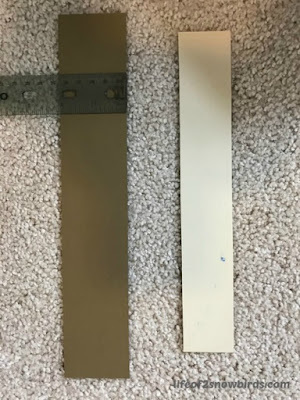 Trim the edge of the smaller piece of card stock with your edger scissor. 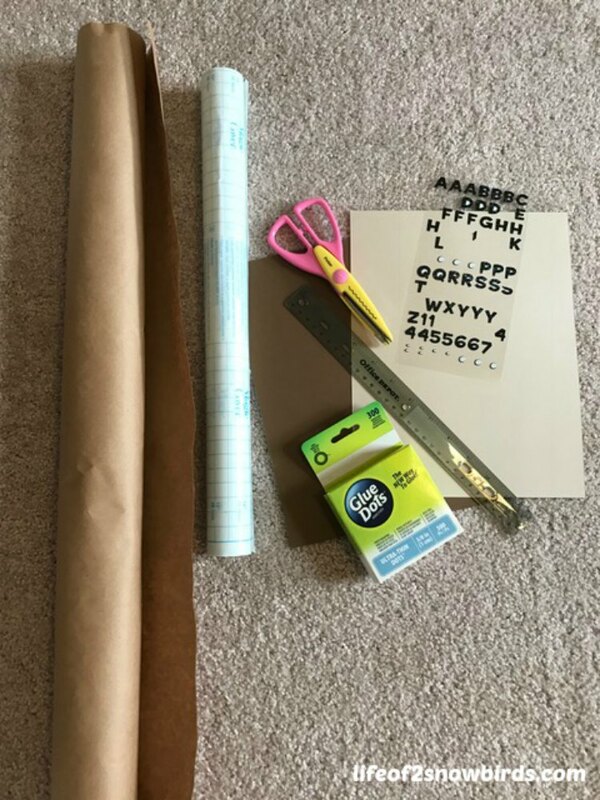 Identify your album by using your number and letter stickers. 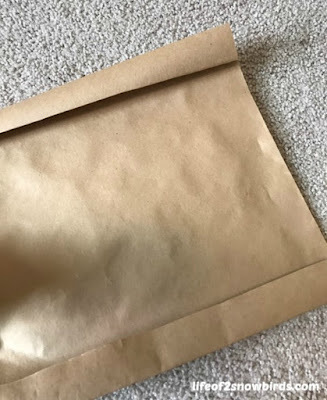 Attach your two pieces of card stock with the glue dots. 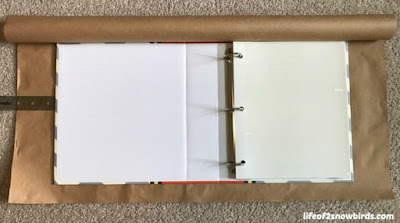 Cover with clear contact and attach identification strip to covered photo album. That's it! Now call over a family member or friend to sit with you on the couch and enjoy looking through your photos together! My kids and I love looking through our albums too. Lots of fun memories! It's a fun activity to enjoy together! thanks for sharing your idea with us at #overthemoon. It is important to keep memories for our children. Thanks so much for having me and for hosting each week! Great idea. I scrapbook, so I have lots of photo albums around. 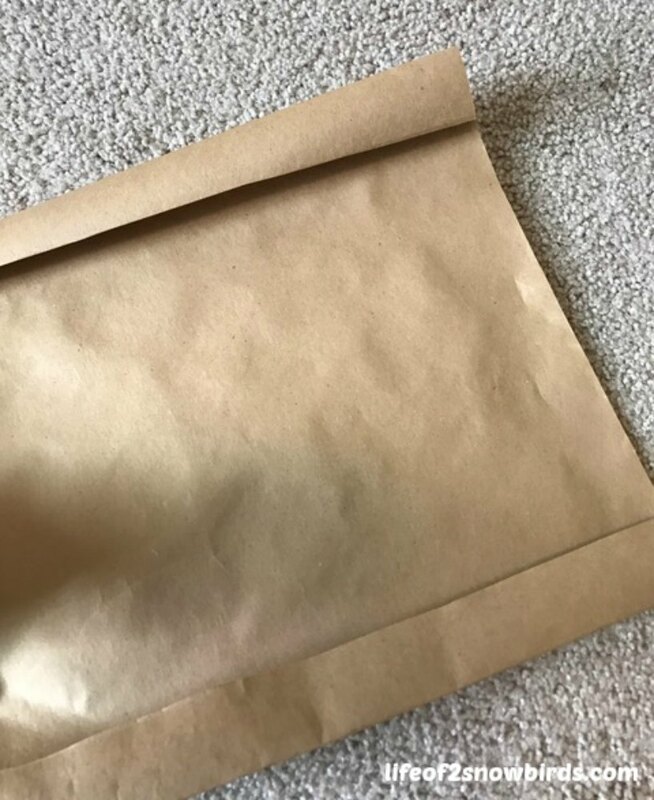 I love the brown paper cover. Thanks for sharing on Sunday's Best. I just took a quick look at your blog because I was wondering if you posted anything about scrapbooking. That is high up on my list of things to do but I've never done it before and I need help!! Please let me know if you have ever posted scrapbooking hints and where to find that post! Thanks!! I love brown craft paper and this is a great and inexpensive way to create a uniform look on the photo albums. Thanks for sharing on Merry Monday. Thank you for having me at your party. I enjoy coming every week to see what everyone was doing during the week!